The Chignecto-Central Regional School Board (CCRSB) announced today that Nolan Pike will deliver the keynote address at Stand Up. Speak Out. on Thursday, Sept. 14. Mr. Pike is a well-known and inspirational LGBTQ* community educator who has travelled throughout the Maritimes working with schools and other organizations to build more inclusive environments for the LGBTQ* community. He is a transgender person who has worked with the Youth Project, which provides services to Nova Scotia youth around the issues of sexual orientation and gender identity, and Equity Educate, which offers consultation, professional development, and resources to help create a more equitable environment for staff, clients, and students. CCRSB hosts Stand Up. Speak Out. each September to promote social justice, respect, anti-bullying and understanding. It is intricately connected with the five pillars of social justice: gender, class, race, abilities, and sexual orientation. To illustrate the connection between Stand Up. Speak Out. and the five pillars, CCRSB placed mystery doors throughout the school board in August. The doors sparked much speculation in a number of communities before CCRSB claimed ownership and explained they were symbolic of open door, open mind, with the five bright colours representing the five pillars of social justice. The mystery doors proved to be a great precursor of this year’s Stand Up. Speak Out. 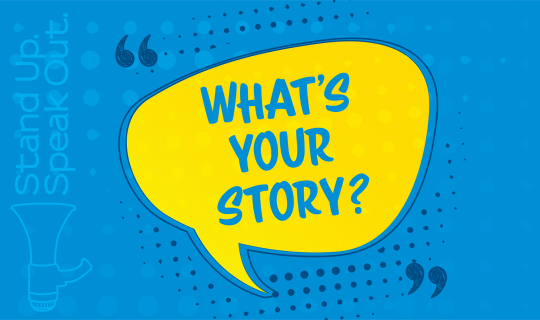 theme: What’s Your Story? CCRSB believes it is through each of our stories that we begin to know each other; it is through our stories that we build relationships and empathy; and it is through our stories that we can more deeply understand the pillars of social justice. “At the end of the day, if we know someone's story, we are more likely to treat them with respect and understanding,” said Mr. Adams. This year’s Stand Up. Speak Out. takes place at the Cobequid Educational Centre (CEC) in Truro. Grade 9 students from junior high schools in the surrounding area will join CEC students in the AV room for the event, which begins at 10:35 a.m. A live stream will also be available, allowing all schools across CCRSB to take part. CEC student council co-presidents Bailey Chisholm and Tara Cashen will emcee the event, with a number of speakers joining them on stage, including Mr. Adams; Trudy Thompson, Chairperson, CCRSB’s Governing Board; and Bill Kaulbach, Principal, CEC. There will also be a number of special videos illustrating the five pillars of social justice, a live art exhibit and music provided by the CEC school band.